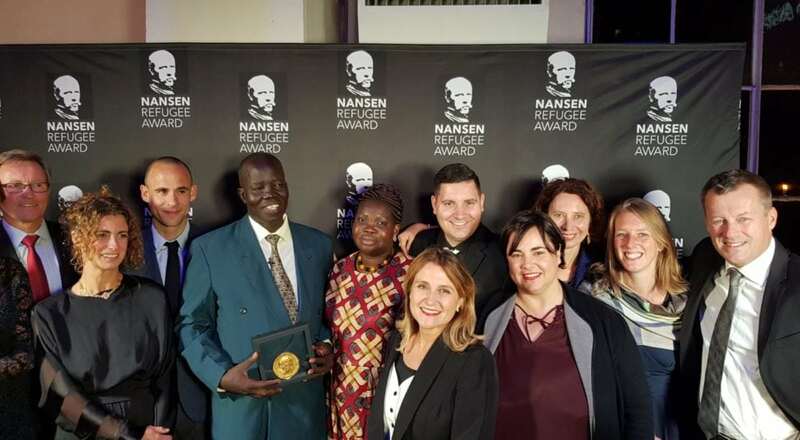 Nansen Awards 2018 Written by Ryan Strauss. 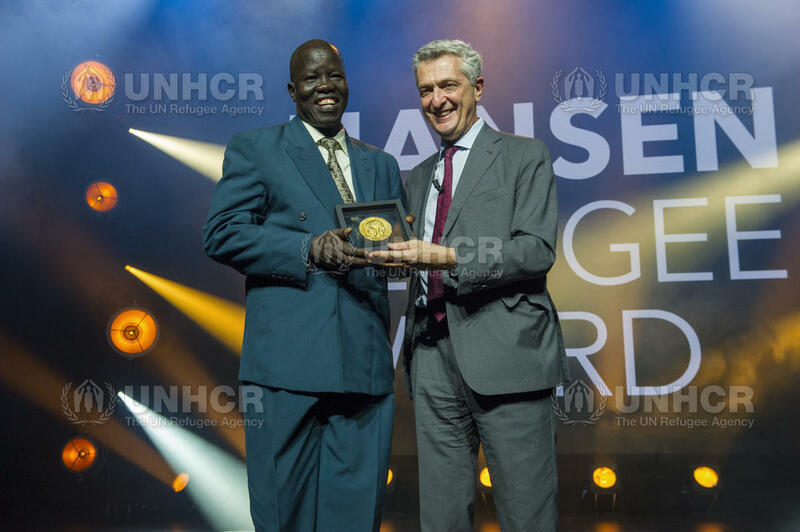 UN High Commissioner for Refugees, Filippo Grandi, presents the 2018 Nansen Refugee Award to Dr. Evan Atar Adaha, a surgeon and medical director at a hospital in north-eastern South Sudan. Photo by UNHCR. Dr Evan Atar Adaha, based in Bunj, South Sudan runs a hospital serving an area the size of Switzerland serving around 200,000 people, about 144,000 of whom are refugees. War in the region has destroyed all other hospitals in the area, so when fighting forced him to close his first hospital in Kurmuk, Sudan he started from zero and built a hospital from scratch in Bunj. Performing nearly 60 surgeries per week in a dimly lit surgical theatre, with a dire shortage of supplies and a broken X-ray machine, Dr Atar has learned how to sleep just about anywhere, sitting up, during the brief breaks that he gets. With his family living in Kenya, he only has the chance to see them about three times a year. He’s grateful for cellular technology which lets him video chat to share in some of life’s big moments with his wife and children. When asked what motivates him and why he stays where he is, at great personal risk, Dr Atar simply says it’s because he has seen the need and he cannot turn away. When given the opportunity to share his story, he quickly rhymes off a prioritised list of medical equipment that the hospital needs, saying that help is not owed to them, but deeply appreciated. Equipment like an oxygen generator tops the list. He shares stories of how patients must share oxygen right now because the five generators they have aren’t enough. 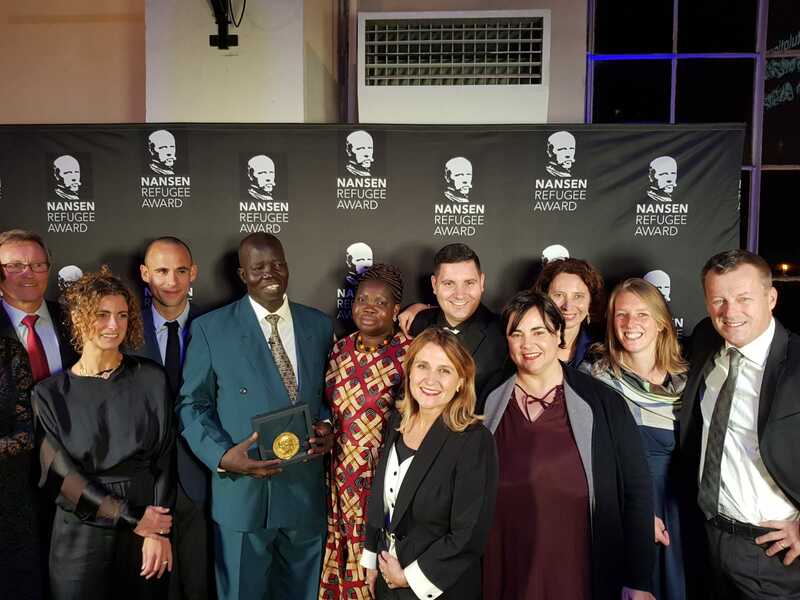 At the UNHCR Nansen Awards in Geneva, Filippo Grandi, UN High Commissioner for Refugees, said he could think of “three or four reasons” why Dr Atar was chosen to receive the award. Most of his patients were refugees and he had lived through displacement himself after fighting forced him to close his first hospital in Kurmuk, Sudan. In addition, he embodied “not only solidarity, but courageous solidarity” with his refugee patients, “two commodities that are very scarce in today’s world”. Dr Atar is changing the world and reminds us of the impact that a single person can have on the lives of so many. The IKEA Foundation sponsors the UNHCR Nansen Awards and is the largest private donor to UNHCR, having supported countless initiatives to better the lives of refugees. This year members of the IKEA Foundation, including CEO Per Heggenes, joined together with IKEA Group CEO Jesper Brodin and co-workers from around the world to discuss what IKEA as a business can do to create meaningful impact on the lives of refugees. They also had the opportunity to have breakfast with Dr Atar the morning after the award ceremony, to be inspired by his story and better understand his motivation and challenges. The ceremony itself was attended by dignitaries from all over the world. UNHCR Goodwill Ambassador Cate Blanchett gave the keynote address, concluding that “people like Dr Atar inspire us to build a better future for everybody”. I have been working with the HR Operations team in Canada for the past four years. In 2012, I had the opportunity to travel to Jordan as an IWitness to see the amazing work that the IKEA Foundation and UNHCR does to create a better life for many of the world’s most vulnerable people. This year I will be participating in a workshop as part of the Nansen Refugee Award ceremony in Geneva with the IKEA Foundation, Tent Foundation, UNHCR and other IKEA co-workers. During the workshop, we’ll discuss how we at IKEA can continue the great work that has already been done to support refugees. At the same time, we’ll be celebrating the great work that Dr Evan Atar Adaha, this year’s winner, has done for thousands of refugees in South Sudan.